Optive lubricant eye drops closely mimic natural human tears and are suitable for everyday hydration of dry and irritated eyes. They are also suitable for use with all types of contact lenses and for anyone who suffers from dry-eye syndrome. Optive drops provide relief for those working in dusty, hot or air-conditioned environments, too. Optive drops were developed to protect the sensitive environment of the human eye. They contain a very gentle preservative called Purite®, instead of traditional preservatives, which often cause side effects. This material breaks down into natural tear components (water and salt) in the eye. 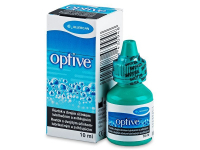 Optive eye drops possess a two-phase moisturising system that is based on the joint actions of several active substances. In the first phase, the eye surface is lubricated using glycerin and CMC (carboxymethyl­cellulose), which forms a protective film to prevent dry eyes. The second phase involves two substances, L-carnitine and erythritol, which rehydrate eye cells and help maintain the balance in the eye environment necessary for osmosis. These are a real help when i'm in the office, my eyes are always drying out so it's great to be able to put in a couple of drops and feel like my eyes are refreshed. Price is good which is always a benefit. Dry eyes have always been an issue for me. Since using these I notice a genuine difference. Optive eye drops are very good for dry eyes.. No side effects or any irritations. I would highly recommend these for dry eyes..
Hi Shaz, Optive Eye Drops are safe to use as needed to relieve dry and irritate eyes. Their purchase does not require a prescription. Great eye-drops, instant relief for dry eyes. Could you comment on how long you can keep these eye-drops once open? Would storing in the fridge be recommended? Hi Renay, according to the manufacturer, Allergan, you can use the Optive eye drops for up to 6 months after opening. There is no need to keep them in the fridge; simply store them at a normal room temperature. Great drops! They're doing wonders for my dry eyes. Highly recommend these to fellow sufferers. Hi Ben, Yes, you are right. Price was £7.99 last time you ordered. Products with sign „sale“ are limited by few weeks or month with a discount. Try to check our website next month and maybe you will find your product discounted again :-) Have a nice day! I have been using Optive eye drops for many years with considerable relief to my eyes. Latterly my eyes have been tearing, watering,stinging and burning. I notice that the packaging has been changed lately and the size of the bottle is also different. Could these changes affect my eyes and where can I get the original Optive eye drops? these eye drops expired April 17 had not been opened. It is 26th March 18 are they safe to use?